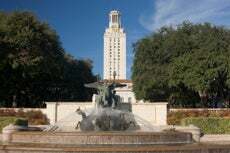 Founded in 1883 and named one of the original eight "public ivy" institutions, UT is located a mile from the state capitol. In the 1920s, its expansion was partly funded by the discovery of oil on campus grounds. A 2007 Texas state law bans credit card marketing at public or private colleges and universities -- unless conducted in designated areas on campus. The law also bans offering incentives to sign up for credit cards. Organizations marketing on Texas college campuses must also provide financial education programs for students. "Once you're at a university, you have this newfound freedom, and you should be able to get a card without your parents co-signing for you. Going into it, you just have to know that it's money you are borrowing; it's not free money. You just have to be responsible about it." The 307-foot tall UT Tower, built in 1937, serves as a landmark and symbol of UT pride. "[The law] would be good in the sense that I don't think when I was 18 I was responsible enough to have a credit card. And I've had friends who obviously have had credit cards, and they are still battling debt. But, at the same time, I think it's everyone's choice. I mean, they are adults; they should be able to figure it out themselves." "I could see how the law could help for kids that get a credit card when they are 18 and destroy their credit before they know what they are doing." "I think that's a good rule. Younger people will just abuse a credit card and not worry about paying it back on time because it doesn't matter much to them. I think they don't understand how being in debt would affect them. "